This supplement comes from a tree. The tree mainly grows in Eastern China and although it does not produce any flowers, it does yield nuts. These are used for cooking and assumed to have healing powers. Even though there are no proven results, the studies done on the effects of Ginkgo so far, are promising. Leaf of the ginkgo biloba tree, native to East Asia. Liquid, tablet, softgel and cap­sule and extract; typically 120 mg to 240 mg extract daily. Choose supplements standardized to 5- to 7-percent terpene lactones and 24-percent fla­vonol glycosides, the active ingredients in ginkgo. Increases blood flow and circulation in Raynaud's phenomenon and claudication (pain in legs or arms caused by reduced circulation due to blocked arteries). There is no strong evidence that ginkgo improves mood, meno­pause symptoms, memory or fatigue. Results from a 2002 double-blind, placebo-controlled trial of ginkgo for the treatment of Raynaud's phenomenon showed that the supplements could reduce the number of disease flares by 56 percent. Ginkgo's side effects include stomach upset, dizziness or headaches. Do not take ginkgo if you are taking blood-thinning medication like aspirin, have epilepsy or experience seizures, have diabetes or are scheduled for surgery. 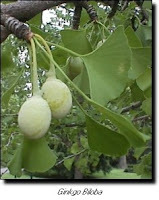 Ginkgo has also been used to treat asthma, bronchitis, fatigue, and tinnitus (ringing, or roaring sounds in the ears). It is said to improve memory, prevent Alzheimer's disease and other types of dementia, multiple sclerosis, along with some other health issues. Ginkgo extracts are also used in skin products. Pour the olive oil over the crumbled Ginkgo leaves, place in an earthenware or glass oven dish (with lid) and stir. Cover with lid, preheat oven to 38 °C and cook for about 1 hour. Take out of the oven and stir again. Leave to macerate for about a week. Stir thoroughly and cook again in a preheated oven for 1 hour. Place herb mixture in a cheesecloth and allow to drain overnight. Melt the beeswax in a saucepan over very low heat and add to mixture. Let cool down. Put the cream in dark jars and check the consistency. The cream is ready when it sticks to the fingers without being too solid or too liquid. The leaves lend themselves very well to make tea from. It can be sweetened with honey, or maple syrup. Of course an artificial sweetener will do just as well. The nuts have a slightly sweet flavor. They are often used in stuffing, soups, desserts, meat and poultry dishes. Many vegetarian recipes include Ginkgo as one of their ingredients in the dishes. The nuts are high in starch content and low in fat. I found some recipes and hope you enjoy them. Use 1-2 teaspoons (approx. 1-2g) of dried, chopped, and washed leaves, or 2 teaspoons (approx. 4-6g) of fresh, chopped leaves to 250 ml boiling water. Place the leaves in a suitable tea infuser or mesh tea ball, put it in a tea pot and add boiling hot water. Steep for 7-8 minutes. Remove the tea infuser or mesh tea ball and, if wanted, add ½ teaspoon honey or maple syrup. Also try the following: add this infusion to your favourite tea or other teas you like. It makes an excellent drink! Ginkgo soup is a tasty way to provide your body with the active ingredients contained in Ginkgo nuts. It is nutritious, strengthens the kidneys, stimulates digestion, and improves hearing. 25g fresh or dried Ginkgo nuts, approx. 1l water, 25g boiled rice or potatoes, salt, lemon juice, black pepper. Peel Ginkgo nuts (remove paper-like outer layer) and chop them to let the ingredients and taste fully develop. Put them in a pot, add the water and bring to the boil. Reduce heat and simmer for approx. 20 minutes until the nuts are soft. Let cool down a little, then blend the water and nuts to a smooth puree in a mixer or food processor. When the mixture has the right consistency, pour it into a bowl and add the boiled rice or potatoes to thicken the soup. Season to taste before serving. For a stronger taste, add celery seeds, thyme, and marjoram. Besides the Vegetarian kitchen, Ginkgo is well known and used in the Chinese and Japanese kitchen as well. It is not commonly used for cooking, in the rest of the world. Should you have trouble finding it, try the specialized markets and Asian stores. "Uncooked ginkgo seeds contain a chemical known as ginkgotoxin, which can cause seizures. Consuming large quantities of seeds over time can cause death. Ginkgo leaf and ginkgo leaf extracts appear to contain little ginkgotoxin." There are benefits and advantages to many things. Even though, something may sound great, experience may teach it is not always as wonderful as portrayed. That is why it is good to take the time, make inquiries and weigh the pros and cons. This goes for almost anything, with one exception: God's Word. We can trust and have faith, that is has only benefits!